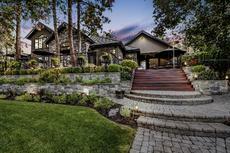 A spectacular Lakefront Estate featuring the finest in finishings and location! The inspired design of this home boasts a dream kitchen with Wolf, Sub Zero and Miele appliances, custom cabinetry & millwork with a master bedroom and ensuite that is beyond compare! Two more bedrooms are located on the main floor along with a large living & dining area, a huge rec room with temperature controlled wine storage and home theatre. Everything is controlled by an integrated and extensive Crestron Automation system and CCTV system - both available from your Mobile device! The home is perfectly positioned to capture all the Lake has to offer. Dock features a large platform area to enjoy the sun and includes 5 Boat lifts.